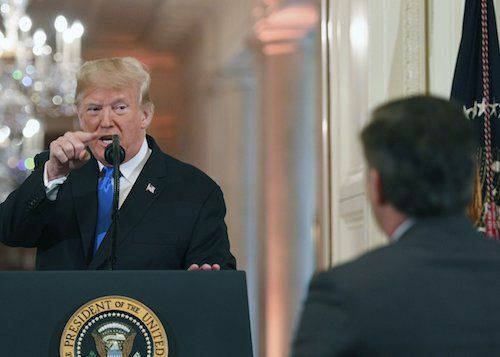 During Jim Acosta’s latest shouting match with Donald Trump, he grappled with a White House intern over a microphone, prompting her bosses to revoke the CNN correspondent’s permanent access pass. Critics have condemned the decision as an unprecedented assault by a president on the free press by a president; they may be forgetting that Trump's predecessors also had antagonistic relationships with reporters. When John Adams became US president in 1797, his concerns about foreign influence of the press led him to sign the 1798 Sedition Act, empowering the government to prosecute anyone who criticised the administration. President Theodore Roosevelt also derided the press in the early 1900s, criticising them for their sensationalism and deceitful reporting. In 1972, President Richard Nixon told Henry Kissinger, his National Security Advisor, that he shouldn’t forget “the press is the enemy" along with academics and the establishment. Barack Obama also had a strained relationship with the media. He complained the press was too harsh on him, and viewed Fox News as a political opponent rather than a legitimate news organisation. He often snubbed the outlet in favour of its competitors, prompting, anchor Chris Wallace to describe his administration as the “biggest bunch of crybabies” he had covered during his 30 years in Washington. Indeed, Obama didn't appear on the show until his last year in office. While he never went as far as claiming Fox News was the "enemy of the people", he did state its political views were destructive to the country. Adams, Roosevelt and Nixon cussed and derided the press behind closed doors or in press letters, while Obama voiced his criticism in a calm, professorial manner. In contrast, Trump has publicly attacked, insulted and questioned the honesty of myriad outlets, and admonished individual reporters such as Acosta. He's also been reluctant to recognise the critical role of the media as a check on government, preferring to accuse them of bias and threaten them with stronger libel laws. Of course, both parties enjoy a mutually beneficial relationship. Trump needs the media to amplify his rhetoric and serve as a target for his supporters to shout at. He also directs their coverage through distraction and manipulation: he framed the migrant caravan as a national emergency before the midterm elections to keep it in the news, but has now tempered his concern. Meanwhile, the president’s controversial words and actions give the press plenty to cover, and his criticism of the press has galvanised support of the institution. Past presidents have accused the press of bias and deceit and decried unflattering coverage. But the Trump administration’s pulling of Acosta’s 'hard pass', a decision it supported with a doctored video of the incident, is a cynical rejection of journalists' right to challenge the president and hold him to account. Indeed, Trump has threatened "there could be others" if reporters are "not respectful". Now Democrats hold the House of Representatives, they have a duty to stand up for the press and prevent the executive branch from silencing its critics.